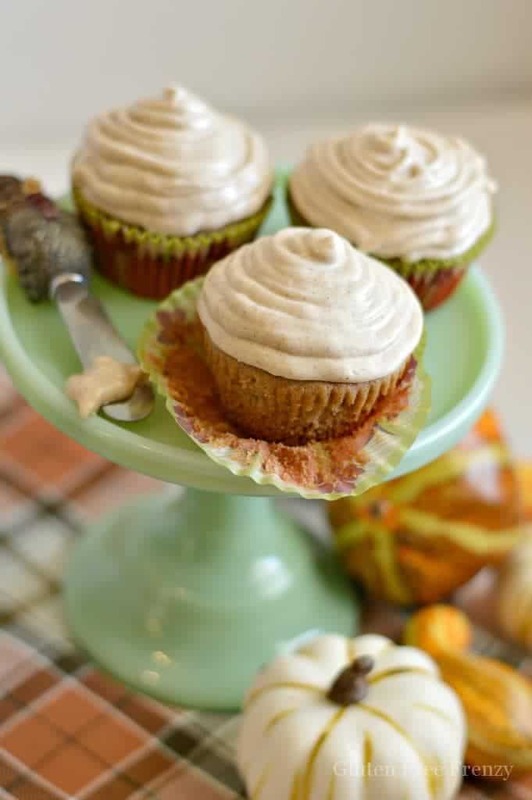 These gluten-free apple cider cupcakes are abundant in warm fall flavors like cinnamon and apple. They are perfect for any harvest gathering. 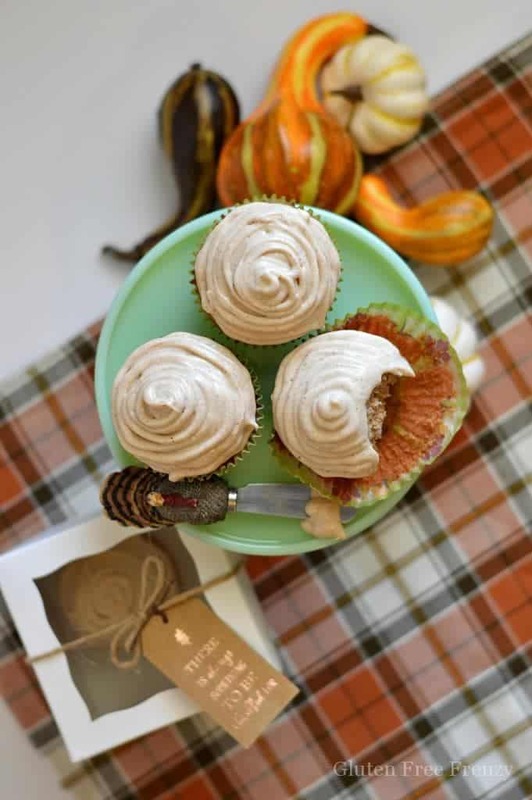 Each bite of these gluten-free apple cider cupcakes is like a explosion of autumn flavors. Nobody would ever guess they are gluten-free! 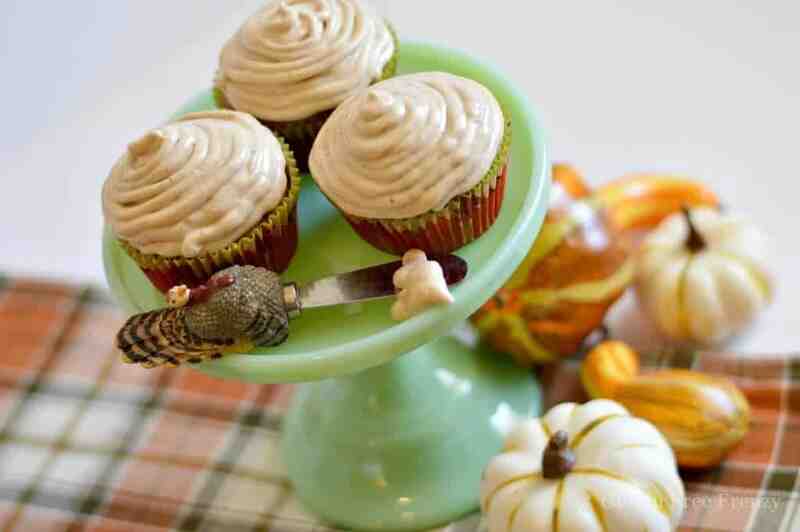 You guys are going to love these gluten-free apple cider cupcakes. One of my favorite things to do during the cooler months of fall is to bake. I don’t just want to bake anything though. No, I want to bake treats and bread loafs full of cozy fall flavors like cinnamon, cloves, apple and nutmeg. 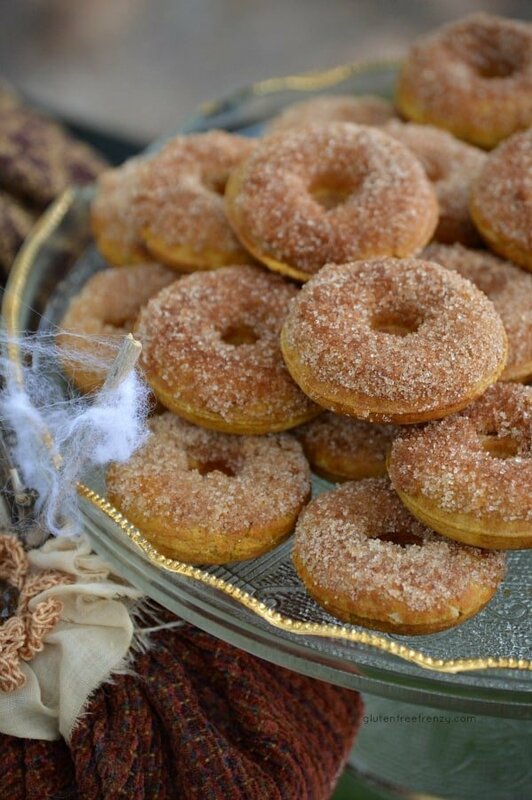 Similar flavors to our chocolate dipped pumpkin spice donuts. 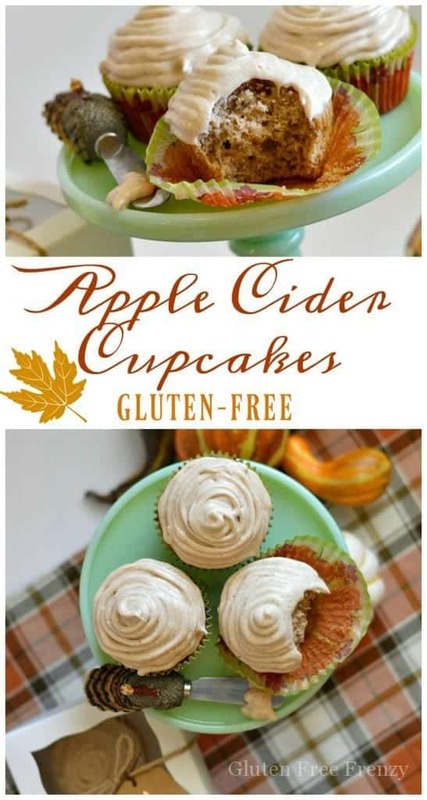 These gluten-free apple cider cupcakes totally take the cake (no pun intended) and leave me feeling ready for leaf jumping and cider sipping! While I typically love gifting friends with spiced zucchini bread this time of year, I wanted to change it up. 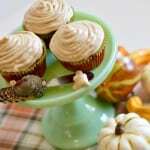 Cupcakes are great for my friends with kids and at gatherings because they are so much easier to serve. I also love getting creative with the cupcake liners we use and packaging. 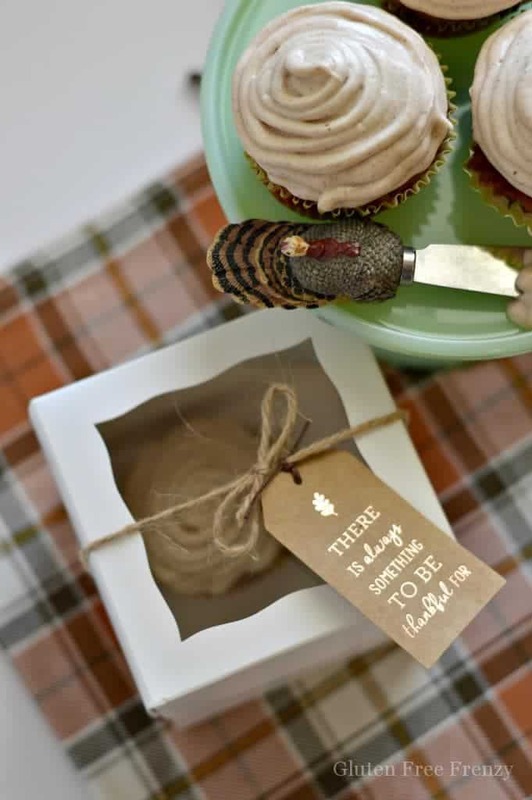 I am a big fan of single cupcake boxes tied in rustic twine and a cute kraft label. 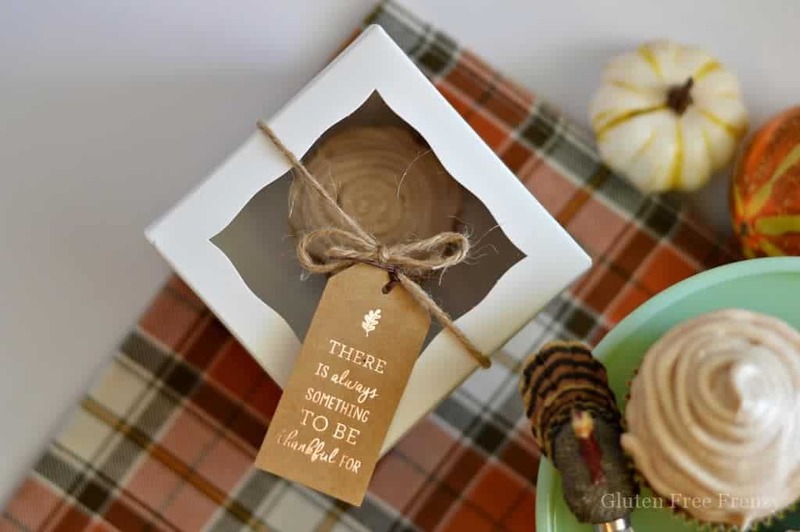 These thankful tags were found at one of my favorite places…the dollar spot in Target. I love that they are both affordable and so cute. They really take the gift to the next level by providing text in a gorgeous foil print that I couldn’t create on my own. My favorite thing about this recipe is that it can be made semi-homemade which totally saves you time in the kitchen. I don’t know about all of you but with the holiday season just weeks away, I want to save my “baking from scratch” energy until then. I promise you though, nobody will ever know the difference. Good news, if you like to bake from scratch all year around. We have a variation that includes a from scratch cake mix. 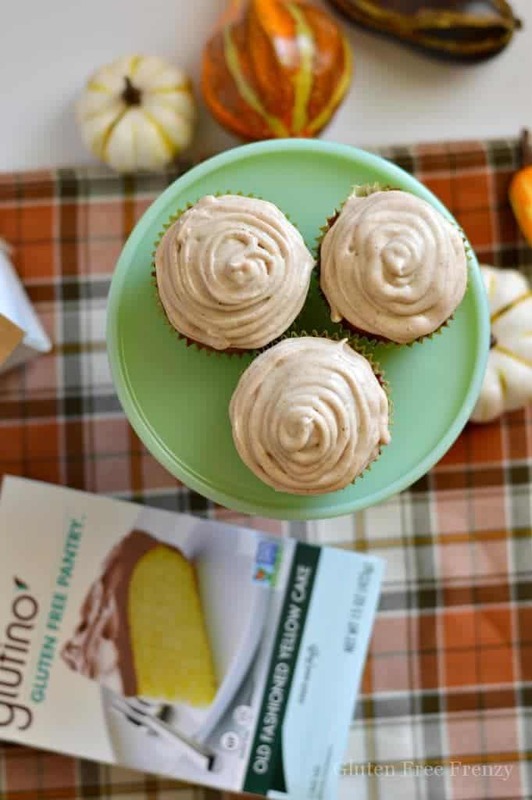 Glutino brand products make it tough for even the most avid gluten eater to tell the difference. Their yellow cake mix and their all -purpose flour are both delicious and affordable. I love that they are also readily available at most grocery stores. 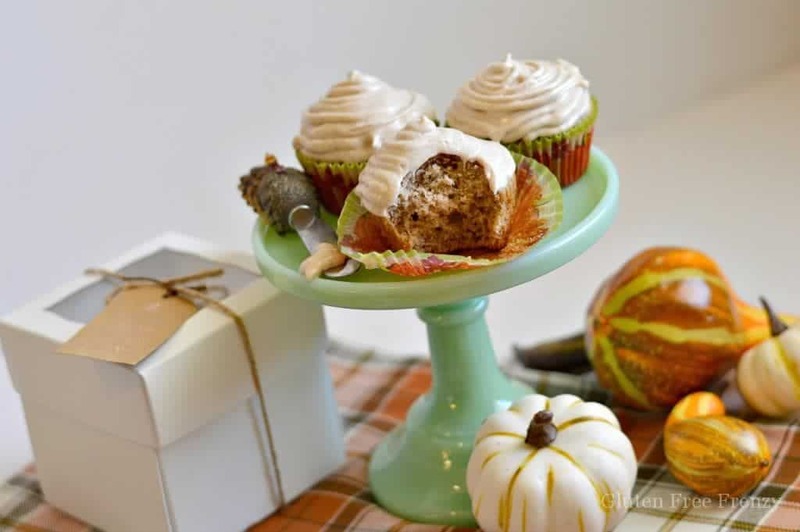 These gluten-free apple cider cupcakes are going to be your new favorite fall dessert! 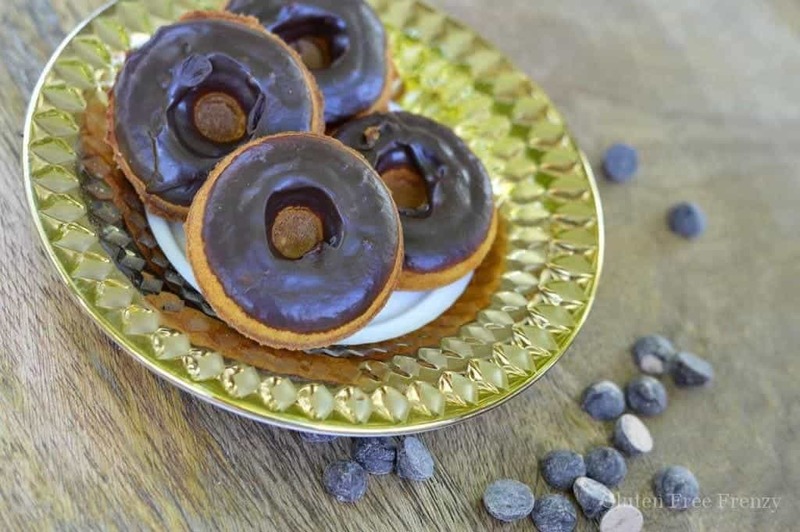 They are always a crowd pleaser and nobody even knows they are gluten-free. Using real cider rather than just apple juice gives it a stronger flavor I feel like. If you can’t find it, apple juice will do. The recipe calls for one cup of cider. A half cup goes in the batter and one-third in the frosting though doesn’t equal one cup. What am I missing? I apologize it has been updated. There is only 1/2 cup in the batter and 1/3 cup in the frosting. Hiya! Do you use salted or unsalted butter for this recipe? Where does the xantham gum come in to play? It’s mentioned in the list of ingredients but not in the directions. Thanks for he help! 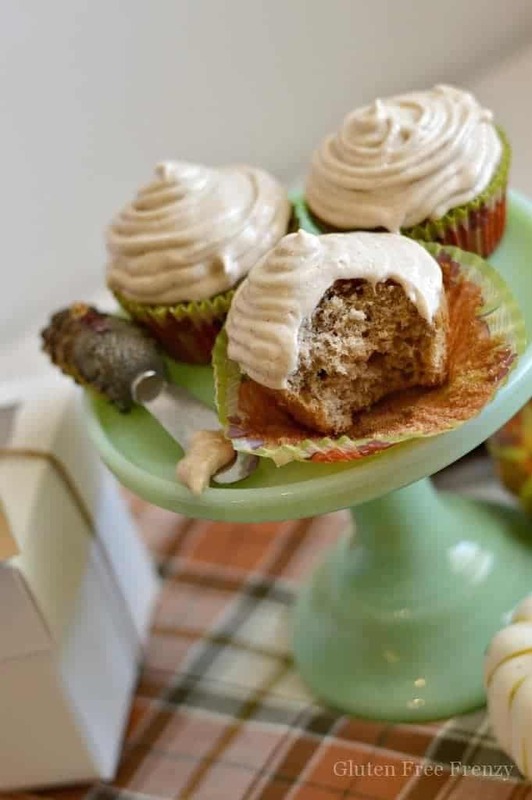 Where is the recipe for the apple cider frosting for the gluten -free apple cider cupcakes? I doubled my recipe and the frosting is waaaay to thin even with extra sugar. Any suggestions? I followed your directions for the frosting and my turned out thin as well, even with adding a little extra sugar. Thoughts? You can cut the apple cider by half and keep the sugar the same. This look absolutely wonderful! 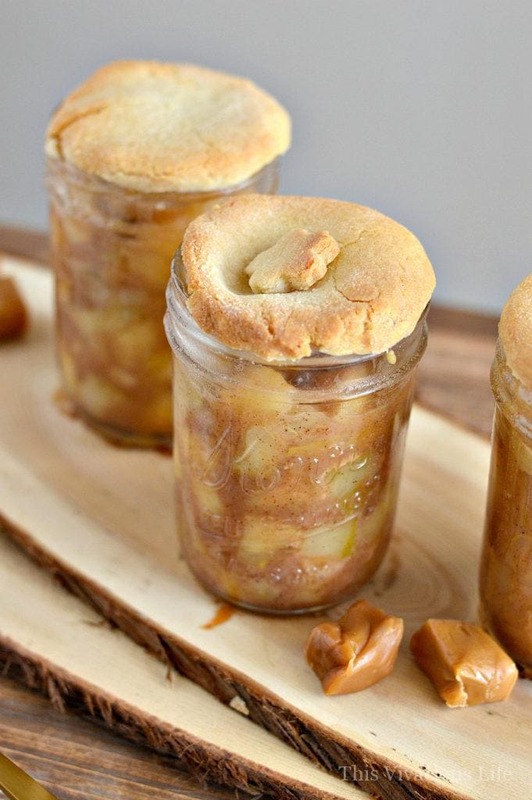 I’m a Celiac and I’m hoping to make these as a treat for both myself and my family. Do you have a particular brand of apple cider that you would recommend? Thank you so much for the recipe! You bet, I am so excited for you to make them! 🙂 You can use any apple cider from the store however, don’t use sparkling. Enjoy! Nope, you need a lot to make the frosting. That is actually much less than most people use in their frostings. Your packaging is adorable. Where did you find the box and tag? Looking forward to trying your recipe as it looks delicious! Aw, thank you so much Sue! 🙂 I actually ordered it with a bunch of other bakery boxes for gifting specifically through a bakery wholesale website. The tags were found in the Target dollar bin. Love that area!